The West ENtrance of the Philadelphia Museum of Art. The museum won two of four NEH grants to Philadelphia cultural institutions announced on Aug. 8. Philadelphia cultural institutions won big in the latest round of National Endowment for the Humanities grants, announced Monday. 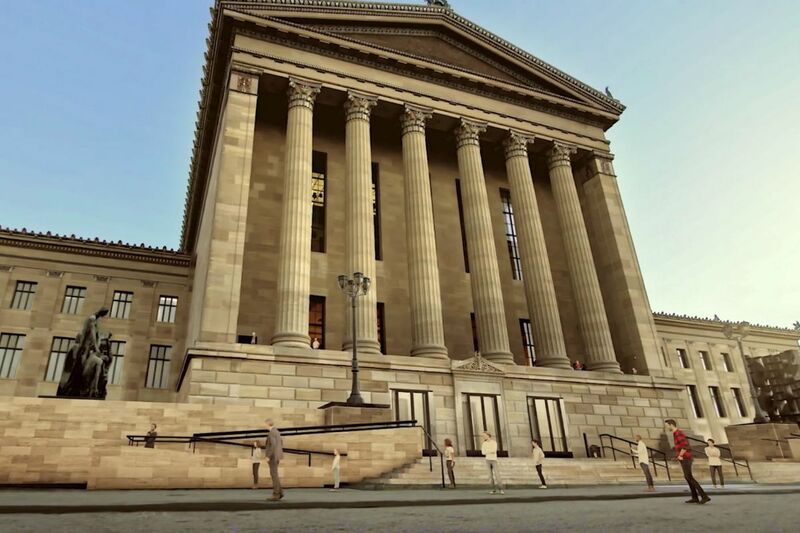 The Philadelphia Museum of Art garnered two NEH grants, with projects at Temple University and the Rendell Center for Civics and Civic Engagement getting one each. The Art Museum received a novel "infrastructure and capacity-building challenge grant" of $500,000 to expand gallery space for its permanent, near-12,000-piece early American collection, including works by Charles Willson Peale, John Singleton Copley, Benjamin West, and Thomas Sully. The grant will help support renovation of the museum's 1928 main building to provide the expanded space. The challenge grant requires the museum to raise a matching amount of nonfederal funds. The museum also received an outright grant of $400,000 toward the reinstallation and reinterpretation of the collection. The Rendell Center got an outright grant of $94,734 for a weeklong seminar for 30 teachers from all over the country, middle school and up, on the First Amendment. And $88,766 went outright to a Temple digital project that uses computational analysis of more than 100 years of the Encyclopaedia Britannica to determine how areas of knowledge changed and grew during the 19th century. "We're way excited," said Kathy Foster, senior curator of American art at the Art Museum. Where the present bookstore and restaurant are will soon be new galleries, enhanced by video that help bring the art objects to life: "videos about how things are made, or exploring their insides, how furniture is turned, how silver is made." Jon Parrish Peede, director of the NEH, called the Art Museum's expansion "a national model." The renovation within the 1928 footprint will ultimately create 10 new gallery areas, about 11,000 square feet, which will allow both exhibition of 200 more objects and addition of 21st-century technologies such as projections. "So you'll have more objects," Peede said, "more visitor space, and new ways to make the gallery accessible." Foster said that the renovation sections will start rolling out as completed, starting in June 2020. "This is a story of immigration," she said, "with Philadelphia as the springboard. We see a fabulous quilt of Americans, Germans, French, Dutch, English, Native Americans, and African Americans. We're giving a picture of how diverse American art is — and it's all about immigrants." Gail Harrity, the museum's president and COO, called the grants "a perfect example of the importance of enlightened public-private partnerships." NEH grants for infrastructure, like the one given to the Art Museum, are new this year. Established in January, they seek to help colleges and universities, museums, archives, and historic sites expand their capacity and sustainability. "We felt a need to get away from grants directly for construction, as we had been doing," Peede said, "and create a grant that institutions can use in a timely, more flexible fashion directed at their needs." The Art Museum was among 29 cultural institutions to receive such grants, for a total of $13.2 million, supporting renovation projects, purchase of equipment and software, and sharing of humanities collections between institutions. "We're ecstatic," said Beth Specker, executive director of the Rendell Center. Bruce Allan Murphy, the Lafayette College law professor directing the First Amendment seminar project for teachers, said, "I am absolutely thrilled. It's a remarkable opportunity. This will give us the resources to bring in the best people in the country to talk to our teachers." He called the present moment "unprecedented in our history. The Constitution and the Bill of Rights are changing right before our eyes. To get everyone up to speed on all that is a real challenge." Peter Logan, the Temple English professor leading the digital project tracking the Britannica, said, "I'm very honored and gratified. This fellowship changes everything. It's enough funding to complete this project in the next 18 months. I had been hoping to complete it before I'm dead. This is a huge improvement over that outlook." The Britannica is "the perfectly curated data set of what counts as knowledge in the 19th century," Logan said. "It was, for its age, incredibly authoritative and extensive: Entries were often written by the very experts who had made innovations and breakthroughs in knowledge." Computer analysis of how the encyclopedia changed over the decades, Logan said, can give us an idea of how knowledge changes and expands, in the 19th century and throughout history.